Social media for dummies, in which I remind myself not to be a jerk. For me, the most important decision to make about using Twitter is to decide what you want from it and use it clearly that way. My own strategy, as I’ve discussed elsewhere, is to treat Twitter like the hallways of a conference, where you can discuss serious matters about academia and the news, but also shares stories with friends about one’s kids, sports, pop culture, and the news. I would encourage anyone considering social media engagement to think first about how and how much they want to present themselves. If you don’t want to put yourself out there, but instead want to lurk and read? You can. Do that! But if you want to interact, the best thing you can do is present yourself exactly as you would like to be seen in that space. You can be incredibly specific in how you choose to do that—starting a Twitter feed solely about your research, or about your favorite sports team, or to share blog posts you’ve written—or be a bit more eclectic. The best and most interesting accounts in my feed are the ones with what we might call a high “Polonius factor” (to thine own selves are they true). Earlier this week, I had a what I thought was a funny idea for an extremely mean tweet. It’s not about anyone I know personally. I don’t follow hir on Twitter, nor does ze follow me. This person is in the news a lot (and is not Donald Trump, FWIW). Ze has a really bad wig although ze is on TV all the time. I wonder why nobody has told hir this?–that’s what I want to tweet. But I don’t, because although this person doesn’t follow me, and I’m sure has no idea I even exist, this person is a living human being (and again, NOT a presidential candidate.) So I don’t publish that tweet (and please don’t try to guess who it is in the comments below, OK?). I don’t because: civilization. Also: shame. I’m a little ashamed I even considered writing that tweet. Also earlier this week, I wanted to reply in a joking way about a funny tweet using some foul language. I try not use this language outside of a very select group of family members and/or friends. But I thought it would make my Twitter followers laugh! And still, I did not tweet out that expression, because I am not anonymous, and I likely would have offended at least as many people as I amused. And for what? Don’t be a jerk online. 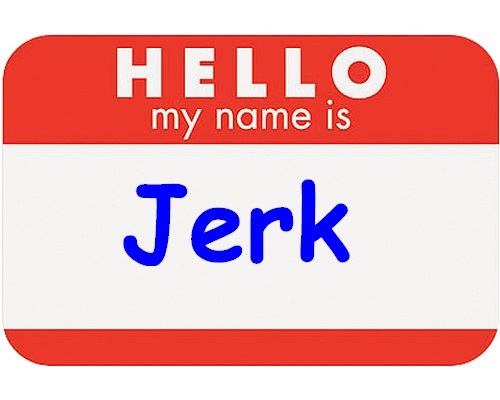 Don’t be a jerk offline, but more people can see and hear you being a jerk if you’re online. In any case, avoid jerkitude. Defense de jerk-er. Ne soyez pas jerk! Or fill in “jerk” with an earthier insult, out of my ear and eyeshot. But don’t be one, OK? ← Teaser Tuesday: Cannibalism, whaaaat? The only problem I see with the hallway conversation analogy is that the latter doesn’t have any real equivalent of the character limit framework. Maybe it should–people would get into more elevators before the doors closed, but as often as you congratulate yourself for having done that, you wish that maybe wouldn’t have happened after all. That’s not to say that there are no temporal conventions at conventions. Hallway chats tend to be shorter than two hour dinners with old grad school friends, but how often do those not turn into group meet-ups with people bumped into on the way to an eatery? They may be longer than bathroom exchanges, because that’s kind of a weird place to talk under any context. Mostly, hallway conversations don’t have a CEO who wonders which of two companies he’d really rather be running, effusive earnings calls with eyebrow-raising stock analysts, querulous stock analyst columns about plateauing user-engagement metrics, or worst of all, anguished wondering among jittery stakeholders about whether it wouldn’t really be better to get into the race to produce a scaleable model for marketing a driverless car. At least as a sideline, in case the analysts turn out to be right. The above strictures on jerkitude, it should be said, are very well taken in any of the above fora. In a class yesterday about the Enlightenment we discussed a wide range of 18th century ways and contexts in which the “don’t hit send” impulse was exactly the right choice for the aspiring philosophe. It really seemed to resonate with a roomful of thirteenth graders. We talked about Ben Franklin’s “resume,” and all of the junctures, besides that crazy stunt with the kite, at which he could have been toast. Thanks as always for the kind words, Ann. The one thing I realize in re-reading that I didn’t put in the post is that mileage varies in part based on one’s institutional affiliation. In my case, that means that I need to keep in mind that I represent a public institution and am bound by various aspects of state ethics laws (most of which seem completely out of context because they were not written with college faculty in mind, but that’s a separate conversation). In practice, that just as you discuss regulating what you tweet, I try to keep my own partisan affiliations off of Twitter. I’m pretty sure someone could figure it out, but in any event I try not to be obvious about it. I also try to avoid being too snarky about my institution. That care and attention can manifest in different ways for different people, depending on their status as tenured, tenure-track, contingent, or not university-affiliated; whether the institution is public, private, religiously affiliated, etc. ; and any number of other factors.